Zoomies with a chase game. Zoomies! I know you’ve seen this and you might have a different word. It’s the energy burst that your dog gets at unpredicted times. 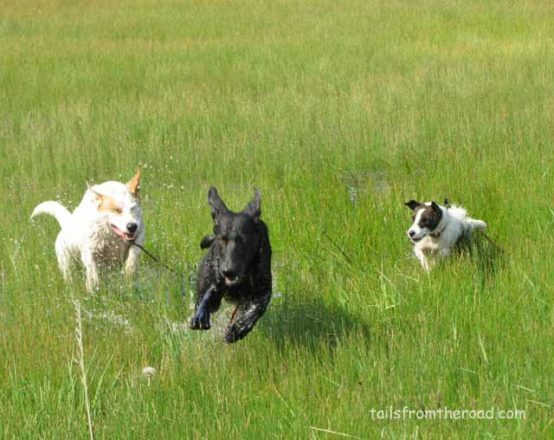 The dogs goes running in huge circles, with a huge grin on his face. They are usually filled with joy, just happy to be running like the wind. It’s one of my favorite things to watch. 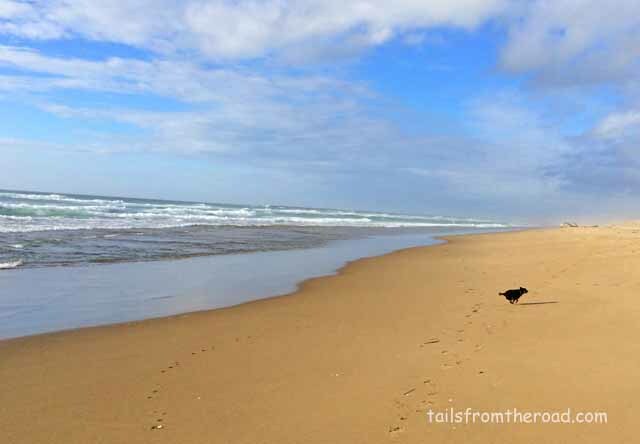 The zoomies can be predicted with my dogs at the beach, especially if they haven’t been at the beach for a while. I recently saw it at White Sands National Monument. I think the criteria for the dogs is to have a large area with the ground that is safe for them to run like the wind, sand and grass are two of my dogs favorites. 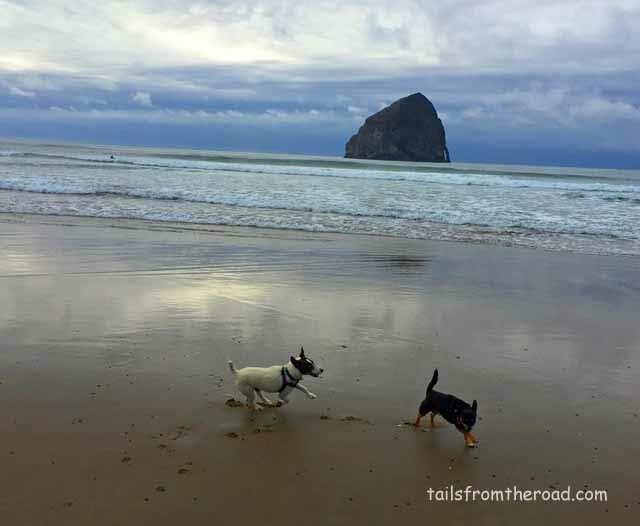 Mick & Romeo at Pacific City Beach in Oregon. Zoomies always appear on the beach! Just 2 nights ago we had stopped in the dog park in Silver City, NM. There was an unneutered male dog that got Mick all excited. There were other dogs, and lots of good play. After some time, everyone left except the young male dog and his owners, which I was having a fun conversation with. (don’t worry they had plans on neutering their dog). Mick was getting all wound up, then there it was, the ZOOMIES! Mick is running in total wild style, in huge circles, totally out of control. When Mick runs like this, he almost has that look “look at me Mom”, I’m super dog! There also is a mischievous look in his eye! Romeo in full Zoomie mode! Years ago, I was in Central Park in New York City and it was in the morning before 9am when dogs can run free in most of the park. A dog had the zoomies and several of us were watching with glee as the dog ran with unbridled joy. The lady said something and I couldn’t understand her, then I asked her and she said “Gone Mad”, that was her word for the zoomies. He’s Gone Mad! I laughed and told her my word was zoomies. What’s your word for the huge energy burst that dogs get? I used to have a rescue greyhound who was spectacularly good at that. Generally one of nature’s laziest creatures, when I took her to an open, level, well-kept area of grassland close to where I lived at the time, she would set herself up a figure-eight circuit, about a hundred yards long and run and run for about three minutes. A number of the local kids gathered to watch her on occasions and pleaded with me to call her in. I did (having recently seen the film ‘An elephant called slowly’, I decided that name would be good for her). “Come here, Slowly,” I’d call. Then, when she arrived, I’d go through a pantomime of scolding her for coming quickly. The kids loved it! Thank you for this series; I shall be saving it (on paper) for reference; and congratulations on completing the A-Z! Love the story about Slowly Keith, thanks for reading. Glad you are getting some use out of the articles. I call it the “go-Vinny-go” after my late pug, Vinny. All of my pugs do this – doesn’t take a wide open space, they’ll get wound up in my living room! Like stored up adrenaline or something. My son’s boxer/bulldog mix does it too. I love it. They look so happy when they’re in this mode. Will miss your posts, but hey! My travel buddy and I will be passing through Santa Fe around May 24. if I can get your contact info perhaps we can meet for lunch or something quick. That will be my long day — Trinidad, CO to Meteor Crater Campground. Hello Debbie, love the story about go Vinny go! I will email you with contact info! Hi Juliet. This has been such a fun ride with you and the boys and all the guest kids. I’m sorry it’s over. I’ve learned so much. Keep in touch. Terri, thanks so much for reading and commenting. I really appreciate it. I’ll probably be in the Northwest later this summer, maybe we’ll connect then. Juliet, just wanted to thank you for the A to Z challenge. I know how much work this whole series must have been, but all of your tips were really helpful – it was like getting a whole dog training class over the course of 26 days! I’m putting several of your tips to work with Sully, as we can always use some fine tuning! Hello Shelley, Thanks for reading and visiting. Let me know if our paths will cross. I’ll be in Santa Fe in May, Denver area in June, Northwest possibly later in summer. Would love to meet you and Sully. Zoomies aka “flipping the crazy switch”.